Coconut oil does not have the same health-friendly pedigree as, for instance, canola, but it has been getting a bit of increased attention as a possible ingredient to use when looking to lose weight or manage cholesterol. There have been studies looking at how coconut oil influences cholesterol, but the body of research at the time of this writing is limited and not equivocal enough to say anything definitive. Instead, all we can do right now is look at the available information and try to draw inferences. Please enjoy a brief breakdown of how coconut oil and cholesterol may relate and what this could mean for your health. Let’s start at the most basic level. There are different brands of coconut oil on the market but most follow a similar nutrition profile. A tablespoon of coconut oil contains roughly 120 calories and 14 grams of fat. Of those fats, 12g are saturated, 1g is monounsaturated, and the remaining gram is a combination of various polyunsaturated fats. These fat values may vary from coconut oil to coconut oil, but you get the general idea: around 120 calories, and way more saturated fat than mono. Coconut oil actually has more saturated fat in it than an equivalent amount of lard. So, if there’s so much saturated fat in coconut oil, and saturated fat is the type we’re all supposed to avoid, why is it getting attention for possible health benefits? The answer has to do with something called lauric acid. Lauric acid is a type of saturated fatty acid and is the type that makes up most of coconut oil’s saturated content. Lauric acid is a “medium-chain” acid, and as a result, it doesn’t get stored in fatty tissue as easily as more common, long-chain acids. In other words: Coconut oil has a high fat value and a lot of saturated fat in it, but it may be a good kind of saturated fat that the body doesn’t store as well. Coconut oil does not contain cholesterol. Eating it does not add extra cholesterol to your body unlike, say, an egg. However, the human body is rarely so simple and it may be that coconut oil can influence cholesterol levels. One study that tends to get cited frequently is this one (https://www.ncbi.nlm.nih.gov/pubmed/19437058), where 40 obese women were randomized to either soybean oil or coconut oil. The coconut oil group showed more HDL cholesterol (the good kind) and less LDL cholesterol than the soybean oil group. However, other studies have probed the finding with more mixed results. Generally speaking, the current research suggests that coconut oil may be better than butter or soybean oil as far as cholesterol is concerned, though the human studies have all been fairly small and short-term. In any case, other types of cholesterol-friendly oil (like canola) tend to have stronger and more definitive profiles. 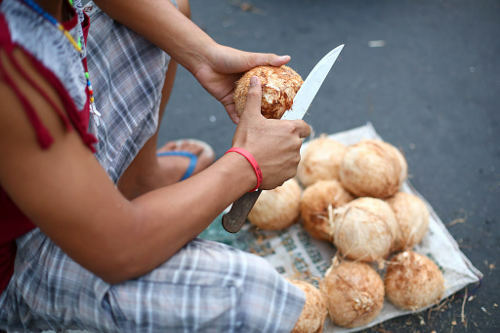 Can Coconut Oil Help in Heart Disease? The idea that coconut oil can help prevent heart disease has two main branches. The first is that it can help by controlling cholesterol. The second is that it can help you lose weight. The cholesterol matter is discussed above, but the weight loss one bears some explanation. As mentioned, the lauric acid that makes up most of coconut oil’s saturated fat content is not stored as well as long-chain fats. This has some noticeable results. For instance, in the 40 women study cited above, the coconut oil group had a larger reduction in waist circumference than the soybean group. However, both groups also lost comparable amounts of weight and there’s no evidence that coconut oil can promote significant weight loss or a BMI improvement. It is also important to remember that coconut oil is still a fat, and a tablespoon still contains around 120 calories. Going overboard with the stuff can have the same consequences as any caloric indulgence. Other than that, using coconut oil in moderation isn’t likely to harm you, but it doesn’t seem like it will do anything special for weight-loss efforts either. Coconut oil has no cholesterol but may help improve HDL and lower LDL levels.